I sat in this hole for thousands of years thinking of nothing but redemption, of reclaiming my good name. I thought of nobody, no cause other than my own... The only thing that matters in the end is the mission: protecting those who would not and cannot protect themselves. The humans. None of us is bigger than that, we will not let our fears, our self-absorption prevent us from seeing it through. Not anymore... Move to the other side of your cell Castiel, and keep your head down. When they say my name, perhaps I won't just be the one who let the Serpent in, perhaps I will be known as one of the many that gave Heaven a second chance. – Gadreel, 9.23 Do You Believe in Miracles? 2.13 9.23 Do You Believe in Miracles? It broke His heart to lock you away, you know. You were God's most trusted, that's why he chose you to protect the Garden. Your one task was to keep evil from entering, from befouling his cherished creation mankind, and you failed it. Gadreel is an angel who according to Metatron was God's most trusted, which led to him being chosen to protect the Garden and keep evil from entering it. Gadreel somehow failed in his task and allowed the Earth to be cursed with evil for which he was blamed and locked up for thousands of years in Heaven's darkest dungeon. He was freed from his imprisonment by Metatron when Metatron expelled all the angels from Heaven in an act of revenge. Once on Earth, Gadreel responds to Dean's call for help under the guise of the angel Ezekiel to help Sam who is dying after the Trials. He tells Dean the only way for him in his weakened state to heal Sam is to take him as a vessel, allowing himself to heal in the process. With Dean's help, he obtains Sam's consent to this, although Dean knows Sam would strongly oppose this course of action. To avoid Sam rejecting Ezekiel, and possibly dying, Dean agrees to keep the possession a secret from Sam. Gadreel can at times take over Sam, act through him and converse with Dean, all without Sam's knowledge. When he manifests, Sam's eyes glow white and sometimes blue. 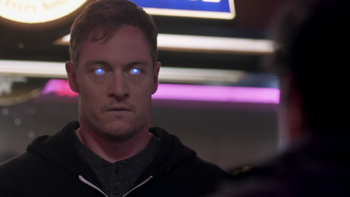 When Gadreel uses his powers, an image of his broken wings can be seen behind him. 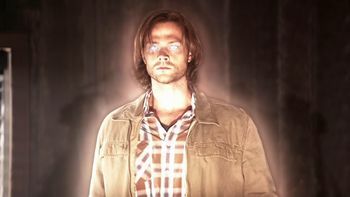 While his angelic powers are reputedly damaged, he has resurrected Castiel and Charlie, although he tells Dean this has weakened him and will prolong the time he needs to remain in Sam in order to heal himself. He demands that Dean keep Castiel away, claiming it will draw other angels to them who may disrupt his healing of Sam. After meeting with Metatron, Gadreel agrees to become his lieutenant for restoring Heaven in order to make up for his past mistakes, and he murders Kevin Tran as proof of his allegiance, taking full control of Sam's body. He is eventually captured by Dean, Castiel, and Crowley and is expelled by Sam after he learns the truth. Undeterred, Gadreel returns to his original vessel to continue working with Metatron. Gadreel works with Metatron to rebuild Heaven -- killing angels like Malachi who refused to join them -- and successfully recruiting many angels to their cause. However, when Metatron uses suicide bombers to convert Castiel's faction, Gadreel has a change of heart and defects to the Winchesters' side. 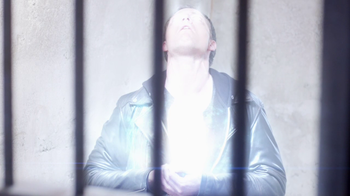 Working with Castiel to weaken Metatron by shattering the angel tablet, Gadreel sacrifices himself to allow Castiel to escape when they are imprisoned in Heaven's dungeon, having finally understood that angels are meant to protect humanity above even themselves and anything they desire, such as Gadreel's desire for personal redemption. When Dean prays for any angels in the area for help in saving Sam, Gadreel who has taken a vessel and is traveling by bus, comes to help and confronts another angel who is trying to get the location of Castiel out of Dean. Gadreel has been injured falling to Earth and is no match for the other angel, but Dean kills the angel with his own blade and saves Gadreel who passes out. While he's unconscious, Dean traps Gadreel in a ring of holy fire and demands answers about why he has come. Gadreel claims his name is "Ezekiel" reveals that he has come to help Dean in response to his prayer, but other, less friendly angels are also coming. Dean releases "Ezekiel" who goes with him to Sam's hospital room to try to heal him. However, both "Ezekiel" and Sam are weak and he is unable to heal Sam right away. As he tries, the building shakes and Ezekiel is able to identify it as an angel coming without a vessel. 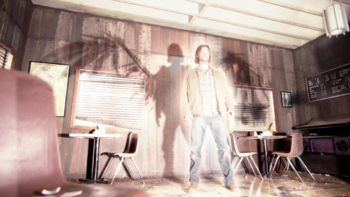 As Sam is unable to leave without dying, Dean puts up angel-warding that keeps other angels out but lets "Ezekiel" stay and then leaves to confront the two angels that arrive while "Ezekiel" continues his efforts to heal Sam. Dean manages to banish the other two angels just before they breach the room, but Sam is too weak for "Ezekiel" to heal even when Dean takes down the warding. "Ezekiel" offers a solution: if he possesses Sam, his ability to heal his vessel will fix the damage Sam endured from the Trials while also allowing him to heal himself of his own injuries. After "Ezekiel" shows Dean how close Sam is to giving up, he agrees and Ezekiel enters Sam's mind in Dean's form and gets him to say yes to "Dean's" plan to save him, allowing "Ezekiel" to take Sam as a vessel. After "Ezekiel" possesses Sam, he and Dean leave the hospital, leaving Ezekiel's confused vessel behind. Ezekiel and Dean decide to have "Ezekiel" let Sam remain in control with no knowledge of "Ezekiel's" presence as if Sam rejects him, in his weakened state "Ezekiel" could be ejected from his body which would be fatal to Sam. "Ezekiel" also erases all memory of his near-death experience from Sam before relinquishing control. Ezekiel revealing his damaged wings. When Sam is in trouble from three demons and is knocked out, "Ezekiel" takes control of his body and distracts the demons by displaying his wings before preceding to kill them with Ruby's knife. His presence causes Abaddon to flee, saving Dean. When Dean comes to see what happened, "Ezekiel" reveals he took control to save Sam who will remember none of what happened and that he used the knife so Dean could explain away the demon deaths. Dean reveals to "Ezekiel" (who he gives the nickname Zeke) that he feels guilty for all of the deaths that have been caused as he stopped Sam from sealing Hell, but "Ezekiel" understands that Dean did it out of love for Sam after being in Sam's mind. "Ezekiel" returns to the place Sam was in when he was knocked out and then returns control to Sam who as "Ezekiel" promised, has no memory of what happened. Ezekiel takes control of Sam, assuring Dean that Sam is in fact feeling better and telling him that while its happening slowly, he is healing Sam. "Ezekiel" warns that a new faction of angels led by Bartholomew is actively taking vessels and searching for Castiel. While Dean appreciates "Ezekiel's" heads-up, he has him give back control to Sam. Desperate to find Castiel after learning that rogue reapers are now after him, Dean calls on Ezekiel for help. "Ezekiel" admonishes him, telling him he can't be in control like that and that he can't sense Castiel as he has warded himself from angels. Dean asks him to use his powers to search for the reapers searching for Castiel and Ezekiel is able to find him that way. After Castiel is killed by the reaper possessing April Kelly, "Ezekiel" resurrects him and Dean covers it up by claiming Sam was knocked out and he tricked the reaper into bringing Castiel back before killing her. At the Bunker, Ezekiel takes control once again to tell Dean that Castiel must leave as he is too dangerous to have around with the angels searching for him. Even with the Bunker's protections, Ezekiel warns that they will not be able to survive a full incursion of angels and that if Castiel doesn't leave, he must leave Sam and flee. As Sam will die if this happens, Dean is forced to tell Castiel to leave. When Charlie Bradbury is killed by the Wicked Witch of the West, Dean asks "Ezekiel" to resurrect her. "Ezekiel" tells Dean that he is only barely back to half-strength and using his powers like that weakens him and will force him to stay in Sam longer than either wants. However, "Ezekiel"relents, telling Dean he can either help with the Witch or bring back Charlie and Dean chooses Charlie. "Ezekiel" resurrects Charlie and Dean passes it off as both Sam and Charlie getting knocked out by the Witch while he drove her off. Charlie later learns the truth about her resurrection, but agrees to keep it a secret from Sam, preventing him from learning about Ezekiel though he is now suspicious as he heard Dean call out to "Zeke" before "Ezekiel" took control. After Sam receives a severe neck wound from Chef Leo, "Ezekiel" briefly takes over to heal the wound, and erases Sam's memory of it. Dean nearly tells Sam the truth, but "Ezekiel" takes control and insists he is not ready to know and that he Sam is still too badly damaged to survive if "Ezekiel" is ejected. "Ezekiel" promises it won't be much longer and returns control to Sam. Metatron speaks to the angel in Sam's body, revealing that he knows the angel possessing Sam is not Ezekiel, but Gadreel. Metatron tells Gadreel he plans to rebuild Heaven and restore it to its former glory. He invites Gadreel to be his second in command, and restore his besmirched name. Gadreel agrees, but Metatron demands a demonstration of his loyalty. He wants those who could oppose him killed, and gives Gadreel a piece of paper with the first target: Kevin Tran. Gadreel takes on the challenge. While Castiel is being tortured by Malachi, he learns that Ezekiel was one of the angels who was killed during the angel's expulsion from Heaven. After he escapes, Cas passes this information onto Dean. While not knowing who is possessing Sam, Dean decides he must be expelled. He asks Kevin for a spell that will help him speak to a person, while repressing the angel possessing them, although without revealing the real reason why. Kevin finds a spell using the angel tablet and a Men of Letters book, and helps Dean set up the sigil that activates the spell in the store-room. Dean gets Sam into the room, and casts the spell. He tells Sam about the possession and that he must eject the angel. However Gadreel was aware of Dean's plan and altered the sigil. Knowing that Dean plans to get rid of him, he punches Dean, briefly knocking him out. He then finds Kevin in the main bunker room and despite Dean's intervention, he kills Kevin and leaves with the angel and demon tablets. In order to get around, Gadreel stole the Impala while trapping Sam in a fantasy world in his mind so that he would be unaware of what was going on and couldn't expel him, but would be unharmed. Following Metatron's orders, Gadreel tracks down the angel Thaddeus who had tortured Gadreel and a friend of his, Abner, while they were imprisoned in Heaven. Gadreel refuses Thaddeus' apologies and kills him with his own angel blade. Gadreel meets with Metatron in a bar where he is surprised to find his original vessel working as a bartender. Gadreel turns over the angel and demon tablets and confirms Kevin and Thaddeus' deaths, but not Dean's, saying that Metatron didn't order him to kill Dean. Metatron orders him to kill another man named Alexander Sarver to prove his loyalty and Gadreel is angry that he must kill again, but Metatron yells at him to stop questioning his orders. Sam expels Gadreel from his body. Traveling to Sommerset, Pennsylvania, Gadreel is surprised to find that Sarver is actually the vessel of his friend Abner and hesitates in killing him. Meeting with Abner when his family is gone, Gadreel learns that he has taken on the role of his vessel, taking care of Sarver's family and taking up his job, happier with his life as a human than of an angel. Abner is horrified to learn that Gadreel killed Thaddeus and tells him that its worth whatever price you have to pay to find happiness. Gadreel then slits Abner's throat, killing him. While cleaning up, Gadreel is approached by Dean who he warns away then knocks out when he tries to kill him. However, while Gadreel is distracted, Castiel knocks him out. Gadreel is taken to an abandoned warehouse where he is chained up and interrogated by Dean who demands to know who he is and why he betrayed him when he had trusted the angel and fought with him. Gadreel tries to comfort him by telling him that Sam is safely locked away in his mind with no idea of what is happening, but threatens to tear his body apart if they try to expel him and insists that he is doing what he has to do. After Castiel confirms that Gadreel healed most of Sam's injuries and he should be able to finish the job once Gadreel is gone, Dean sets Crowley on him to use his spikes to break into Gadreel's base coding to try to draw out Sam's mind. After hours, Crowley succeeds in activating Gadreel's "factory settings" and they learn who he is leaving Castiel furious because of all the trouble he caused. Gadreel returns to his original vessel. However, Gadreel retakes control saying he has withstood much worse torture and can wait forever. Desperate, Dean asks Castiel to possess Sam too to wake him up and let him know what is happening, but Gadreel is just amused as Castiel would need Sam's permission also. Crowley offers to do it instead in exchange for his freedom and with no choice, Dean agrees and has Castiel remove Sam's anti-possession tattoo despite Gadreel's warnings. In Sam's mind, Gadreel, in the form of his original vessel, confronts Sam and Crowley after Sam learns the truth. Gadreel is angered when Crowley calls him the "original chump," saying he isn't anymore and tells Crowley to run. Instead, Crowley fights him to no avail and Sam attacks. Gadreel initially has the upper hand, but Sam manages to overpower him and demands Gadreel "get the hell out," finally expelling him. 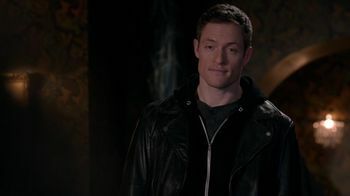 Expelled from Sam, Gadreel returns to the bar where Metatron is waiting in his natural form and gains permission from his original vessel once more. Gadreel possesses the man again and Metatron realizes the Winchesters once again interfered in their plans. It is revealed that a side effect of Gadreel's healing of Sam caused some of his grace to remain behind. Castiel tried to extract it from Sam to find Gadreel but the effects caused Sam to revert back to his pre-Gadreel state and started having flashbacks and was forced to stop so Sam wouldn't die, thus the amount of Grace they had was not enough to track him. Gadreel continued to work for Metatron, who was now playing God with the power of the tablets, and was recruiting angels to join his legion with a spell to lure angels in. Those that refused Gadreel would kill. The angel continued this in a pattern across America but in one hit Metatron ordered Gadreel to deliberately leave one alive for Castiel to find. Later Gadreel went to a shop of a hunter for ingredients he needed, killing the owner when he was finished. But when he was leaving in the back ally, he was trapped in holy fire by Sam and Dean. Gadreel was then placed in an angel's trap and interrogated for Metatron's whereabouts but refused to give in and tried to make Dean kill him, but he refused to do so and instead beating him unconscious. When Metatron abducts Castiel he offers to make an exchange: Castiel for Gadreel. Gadreel later visits Metatron who was writing down his next plan, or "story" as he was referring to, and asked if his own capture was a part of the plan but Metatron claimed that Gadreel's capture was unexpected. When an angel infiltrates Castiel's faction and kills a prisoner of from Metatron's faction, Castiel seeks out Gadreel's assistance. Gadreel meets Castiel in a forest where he tries to convince him that Metatron is the wrong side and Gadreel is being used just as he was which lead to the angels falling but also Gadreel's release. Gadreel is skeptical because of his honor but Castiel reminds him of his mistake in the Garden and that following Metatron will have the same consequences, telling him that there are other ways that he can redeem his failure. Before they can continue they are ambushed by two of Metatron's followers and Gadreel flees in the confusion. Later, Gadreel returns to Castiel to apologize and claims not to have known of Metatron's spies but tells Castiel that he cannot simply abandon his cause which he was worked hard for. Castiel tells him that he understands his sense of honor but makes Gadreel an offer to be his spy among Metatron's ranks and asks him to think it over. In Metatron's office, Gadreel reminds Metatron that they're losing because Castiel's numbers outrank theirs. Gadreel admits that they're capable as they captured him, although Metatron defends that he wasn't meant to be harmed and changes the subject to when he previously met with Castiel. Gadreel assures him that he serves Heaven, passing Castiel's words off as lies. Gadreel was present with Metatron when he met with other angels in charge of their own factions to gain their trust, all those who refused Gadreel would kill. However, Gadreel was unable to kill Tyrus due to the number of people in the area, but made the point to Metatron that no one would follow him over Castiel if he dies. Tyrus offers to talk about joining forces if Metatron beats him at bowling, but Metatron loses. To turn Castiel's minions against him, Metatron took some of Gadreel's recruited angels including the reaper Tessa, and brainwashed them into becoming suicide bombers to kill Metatron's angels and all surrounding humans in the name of Castiel. Metatron even risks his and Gadreel's lives when they met with Tyrus by having Constantine use himself as a suicide bomber in a bowling alley to manipulate his followers into joining his side. As Castiel's former followers leave him and go to Metatron to be his followers, Gadreel discovers the truth about Metatron's plan as it resulted in the deaths of his own minions, causing Gadreel to betray Metatron and seek an alliance with Castiel and the Winchesters. When Gadreel arrives at the Bunker to make his case to Castiel, he is attacked by Dean, with the First Blade, badly slashing him across his chest. Gadreel sacrifices himself to free Castiel from Heaven's prison. Sam and Castiel find that Gadreel has fled the Bunker in fear for his life. They find his car some distance away and covered in blood with Gadreel close by, seriously wounded. Gadreel begs them not to hurt him and advises Castiel not to heal him as it will weaken him with his already weak grace. Castiel heals a grateful Gadreel's wound anyway. Gadreel is stunned to learn that Dean is being affected by the Mark of Cain and that he used the First Blade on him. Gadreel reveals that Metatron's great power comes from the angel tablet and that if they can break it, it will allow Dean to kill Metatron. In order to do so, Gadreel leads Castiel to the portal to Heaven, pretending that Castiel is his prisoner so that the angels guarding it will let them pass. In Heaven, Castiel and Gadreel are led to what is apparently Metatron's office, but what is really Heaven's dungeon to Gadreel's horror. Castiel and Gadreel try to convince Hannah to release them to no avail, as she sees Gadreel as someone who only cares about himself. Realizing this to be true, Gadreel carves the Enochian sigil the suicide bomber angels used into his chest and makes a speech about how while imprisoned, he only thought about redeeming himself for his actions above all else when really he should be focusing on the true mission: protect humanity at all costs. Finally understanding this and hoping that his name will one day be remembered as one of those who restored Heaven instead of as the one that let the Serpent into the Garden of Eden, Gadreel orders Castiel and Hannah away and then kills himself with a piece of rock from the dungeon floor, causing an explosion that releases Castiel and convinces a horrified Hannah of the truth. His sacrifice allows Castiel to break the angel tablet and Metatron's power and finally stop him. While Sam and Dean are trying to figure out how to track Kelly Kline and her Nephilim child, Sam brings up Gadreel and how he and Castiel attempt to use a tracking spell by extracting the residual grace left in Sam. Sam surmises that with Jack being half-human, half-angel if they extract his grace he will just be a kid and it wouldn't mean killing him or Kelly. While devising a way to help Dean force Michael out of his mind, Sam mentions how Gadreel sent him into a dream world in his mind while he was possessed until Crowley helped him regain control and cast him out. However with Crowley dead, Sam improvises with the machine created by the British Men of Letters to enter Dean's mind. Gadreel (also known as Gadriel and Gael) was one of the chief fallen watcher angels. It is believed that Gadreel not Satan was the one to seduce Eve with knowledge. Some other theories include that he fathered Cain with Eve, taught mankind the art of warfare, and introduced witchcraft to humanity. Because the second episode of season nine was shot first, Jared had to develop the character of Ezekiel/Gadreel before Tahmoh Penikett (who plays Ezekiel/Gadreel in 9.01 I Think I'm Gonna Like It Here) was cast. The fandom portmanteau to describe Ezekiel when he is possessing Sam is Sazekiel. When it was revealed Ezekiel was actually Gadreel, the fandom took using the name Sadreel. This page was last edited on 12 March 2019, at 09:34.